I love dim sum. My friend Lisa and I meet up once a week or once every other week for lunch at our favorite dim sum spot. There’s something about dumplings I find very comforting. Pork and Preserved Egg Congee, also known as Jook or Porridge is a common item you’ll find at a lot of dim sum restaurants. I used to love ordering this dish but by the time when I’m done eating, I’m already halfway full which doesn’t leave me a lot of room for other dishes. I now make them at home whenever I have a craving. It’s usually when I’m under the weather or when the weather is gloomy. Neither was the case today, I just felt like having something soothing. 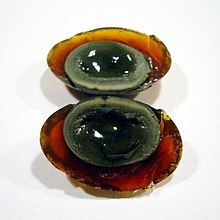 Preserved egg, also known as century egg, or thousand-year-old egg, or pídàn is a Chinese cuisine ingredient made by preserving duck, chicken or quail egg in a mixture of clay, ash, salt, quicklime, and rice hulls for several weeks to several months (source: Wikipedia). The egg yolk has a soft creamy texture, while the egg “white” has more of a rubbery texture. This may sound unappetizing or undesirable but it imparts a great deal of flavor into the dish. This is what the egg looks like. In a medium size pot (I used a 3 quart stock pot) over medium high heat, add olive oil and ground pork. Crumble and brown pork. Add leek and sauté them until soft, about 1-2 minutes. Add rice. Lightly sauté the rice until it has absorbed most of the pork juice, about 3-5 minutes. Season with salt. Add water (start with 5 cups and see if you’ll need that last cup at the end if the consistency isn’t to your liking) and continue to stir. Turn the heat down to medium low, cover and let the rice simmer for 40-45 minutes. By then, most of the water will have been absorbed. Stir the porridge and see if the consistency is to your liking. If not, add more water (5 cups was fine for me). Stir in preserved eggs and let it simmer for another 10-15 minutes. At this point, the porridge is ready. Check for seasoning. Add chopped scallions and cilantro, if desired and sprinkle some white pepper. 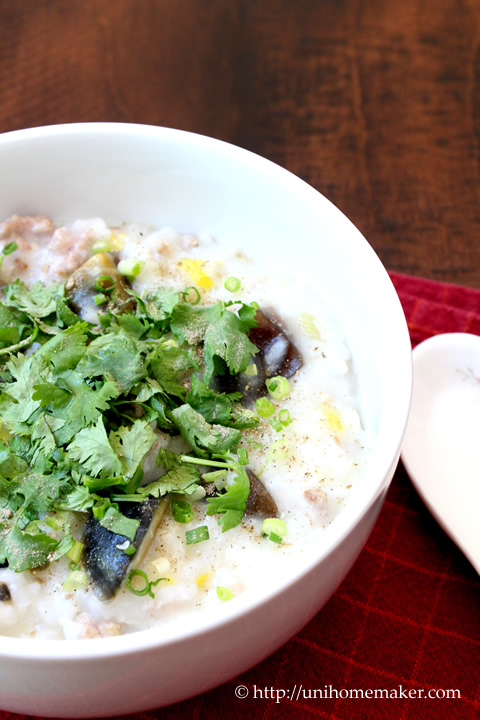 I love century egg congee! Yours looks really tasty! I have never had anything like this before and it looks so delicious! I’ve never had anything like this before. It looks delicious. I’ve never had congee before but now I’m super curious. Your pictures look lovely, make everything look yummy! You’re so sweet, thank you so much Pamela! When I was young my mom used to make a different style of congee, it was much more bland and not as thick. Anne made this and I loved it! It has enough flavor to be interesting, but not too much that you can’t enjoy it when you’re feeling under the weather. As soon as I saw the photo, I thought of my favorite dim sum! I have to order the porridge first. That dish looks so delicious, Anne! I haven’t had dim sum in ages since I worked in San Francisco. You’re making me miss it! What an interesting and enticing dish! When I first moved to SE Asia, I was so thrown by congee, but once I started sampling it with all the different toppings, I was hooked. It’s the ultimate comfort food – now I crave it. This one looks particularly wonderful, Anne – and those preserved eggs always intrigue me! This is my ultimate favourite congee. If I see this in a menu anywhere, you can bet I’d order this. I’ve made this at home several times too. So so so so comforting and delicious! Excellent recipe. 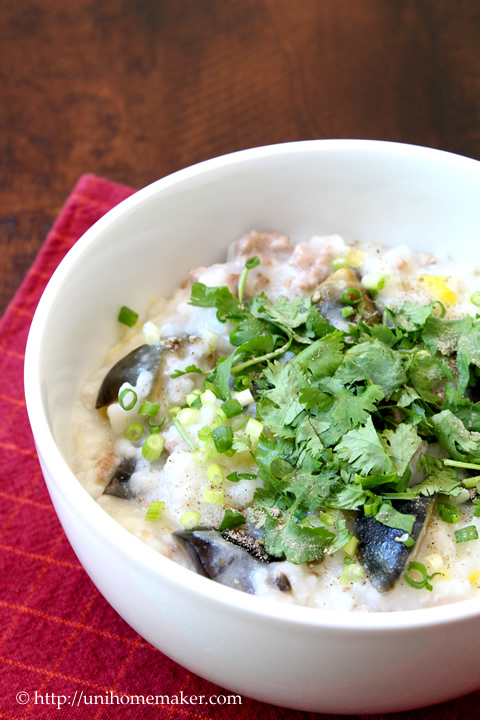 Your congee looks so delicious! My boyfriend loves this dish and always gets it at dim sum restaurants. We will try out this recipe for sure–thanks for sharing it! I’ve never had congee before…this looks so interesting and delicious!! I never knew what congee meant but I’m not sure I could eat preserved eggs! love congee but never made it at home. My favourite is the seafood kind 😀 Thanks for your recipe. Always wanted to try it at home. Congee is the breakfast dish of champions in Hong Kong. It is served on every street corner. You either love or hate 1000 year old eggs and I fall in the group of the latter. I like congee when I am sick or feeling under the weather but just minus those scary preserved eggs. Love congee. I raised my babies on it. I’ve never had congee before, but now I want to try it. Looks delicious! 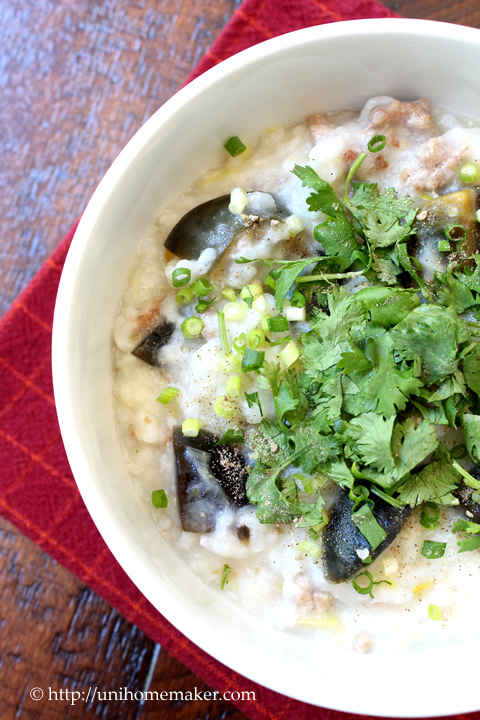 especially with savoury porridge with slightly tangy dessing and tons of cilantro…. I never had this before Anne! You make me want to try it! Looks delicious and comforting too. You had me at dim sum and congee. Love, love this post! This just makes me want to curl up on the couch and eat a steamy bowl of congee for breakfast. There’s nothing quite as comforting, to this day! The century eggs bring it all together for me. And I’m really happy to have found your blog—lovely stuff. This post is an AWESOME reminder that I haven’t had dim sum in FAR too long! 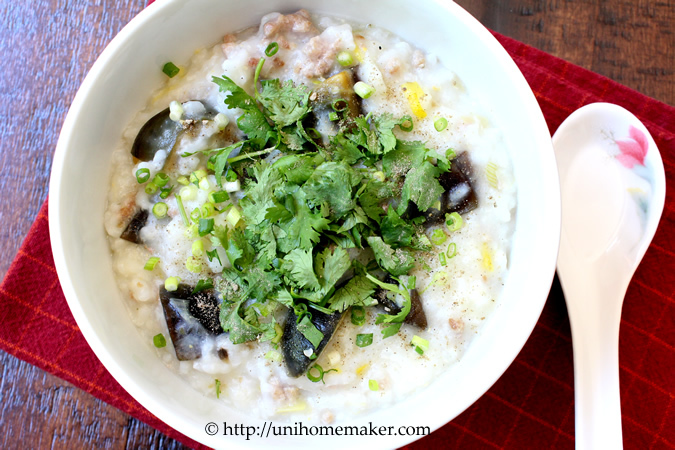 I’e never had congee, but it does sound like the perfect comfort breakfast! What an interesting dish! I’ve got a cold and I think this would be perfect right now. Although I’ve had dim sum on many occasions, I have yet to try congee. I’m not sure I’ve ever seen it. It looks lovely. 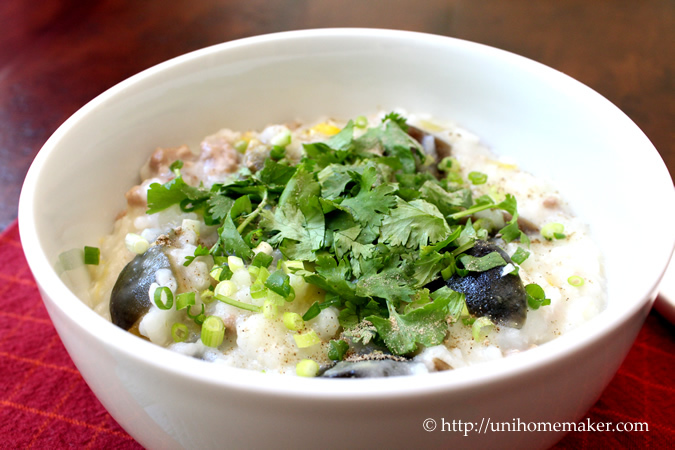 My kids love congee and I used to make it for them when they were growing up, now they make their own. I am so tempted to give this a go. I don’t like porridge, generally, but I do love rice so maybe I’d like rice porridge. There is no way I’ll be able to track down the preserved eggs though 😦 Do you have any suggestions as to what other ingredients I could use? Thank you for this recipe! We are actually heading to China early next year, and I’m trying to prepare more traditional foods to get us used to them.